Sometimes I think I suffer from short-term memory loss. Correction…sometimes I think I suffer from short-term ‘thankfulness’ memory loss. I always like to think of myself as someone who recognizes the many blessings in my life and never takes anything for granted. And yet, again and again, I find myself repeating a familiar pattern. When life gets challenging or things don’t go as planned or you slip into a ‘woe is me’ mindset and find yourself in need of the ‘waaaaa’mbulance 😉 , it’s so easy to forget to look back on your life and see how you many times problems have been resolved and prayers have been answered. So, I think that when we reach the end of another year, it’s even more important to look back and remember. 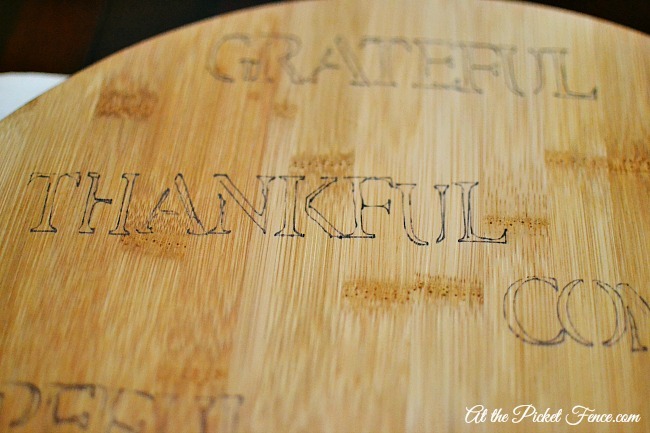 Remember how much for which we are thankful and grateful. 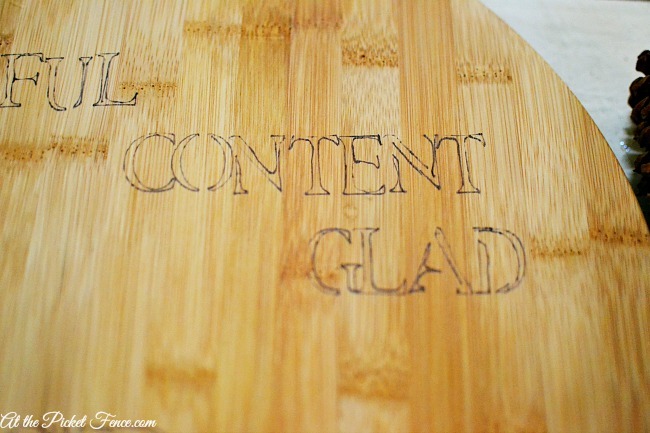 To remember the moments of contentment and gladness. To remember how blessed we are. And how even in the midst of difficult circumstances or the challenging seasons of life, we can still find peace and joy. And the end of the year is also a time for looking forward. For feeling hopeful for the future. And I thought that maybe those who gather at my table this Thanksgiving could also benefit from an easy remedy for short-term ‘thankfulness’ memory loss. 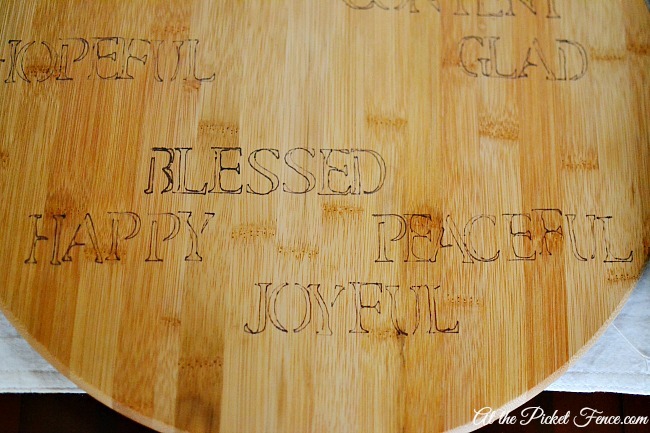 A simple wood lazy susan, letter stencils and a black sharpie pen are all you need to create this centerpiece. 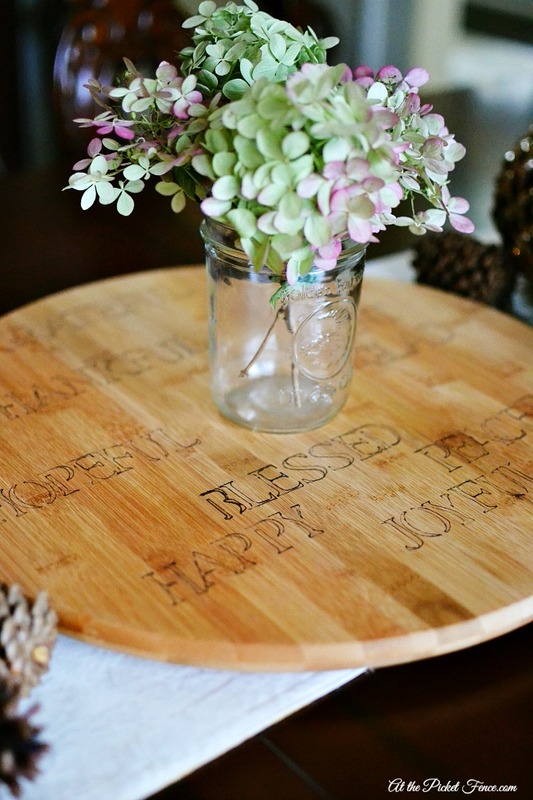 Turn it this way or that way and allow your guests to see the words and reflect back on their year too. Sometimes we simply need gentle reminders of God’s faithfulness. Of how He has carried us over those mountain top highs and through those valley lows that are all an inevitable part of our journey here on earth. You know, it’s kind of ironic. On the one hand, it seems that the older we get the more forgetful we become. And yet, on the other hand, we reach a point where we’ve experienced so much of life that it becomes easier and easier to remember. To remember how much we have to be thankful for, even when everything around us seems to be going wrong. Or when prayers are going unanswered or we are experiencing deep pain and loss. Maybe, just maybe, our ‘thankfulness’ memory is actually getting sharpened by those tough times. 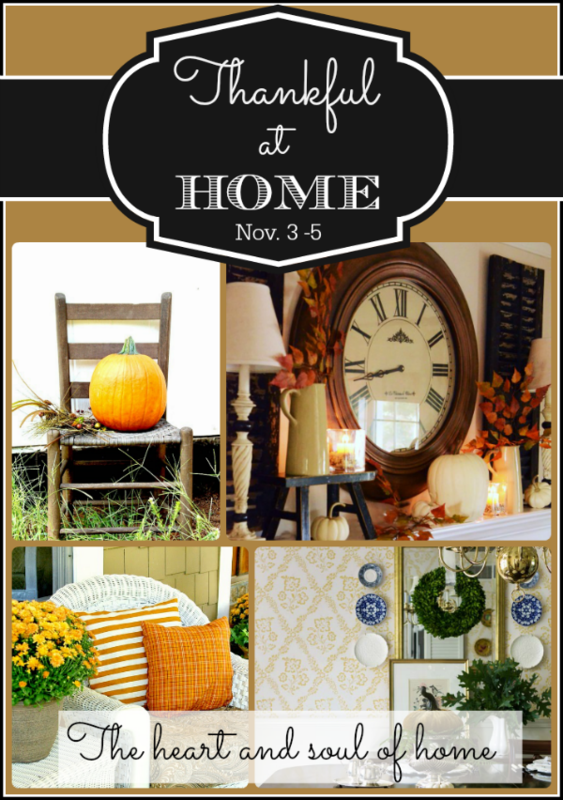 Now, speaking of being thankful…I’m so thrilled to be joining this amazing group of bloggers who are all sharing their take on what it means to be ‘Thankful at Home’. I hope you will pay them all a visit and enjoy the inspiration provided to help you usher in this season of thanksgiving. 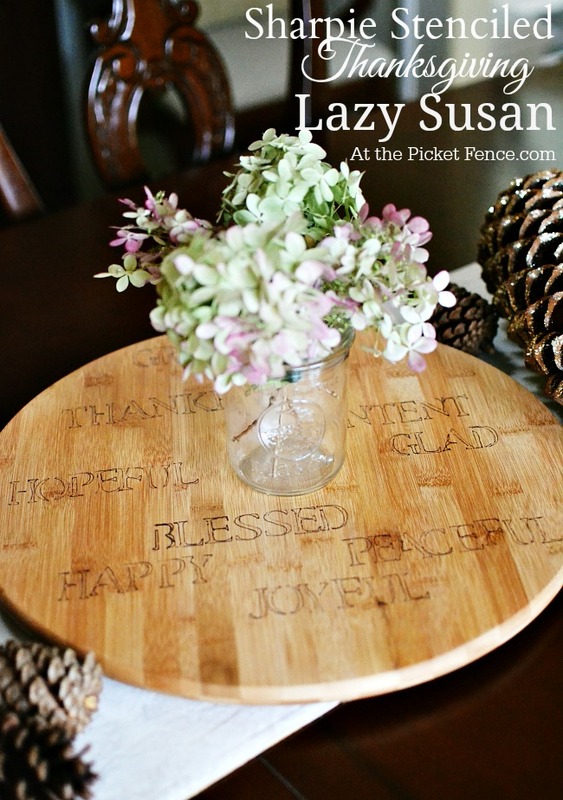 16 Comments on "Sharpie Stenciled Thanksgiving Lazy Susan"
Well said and well done Vanessa!….such beautiful sentiments on the Lazy Susan….practical and inspirational! I so love the quote by Julie-Anne….I am writing that one down now!…I am blessed to know such a wonderful person as you, Vanessa!…. So true so true. 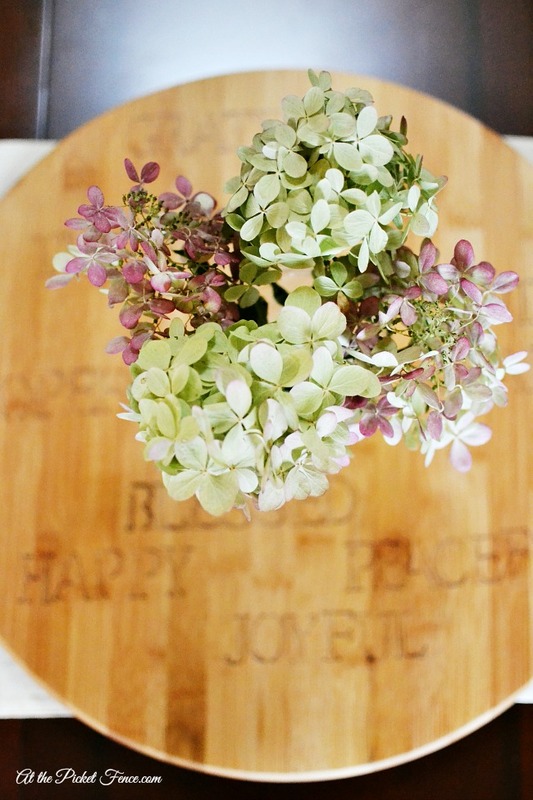 Well said and I love the centerpiece idea. 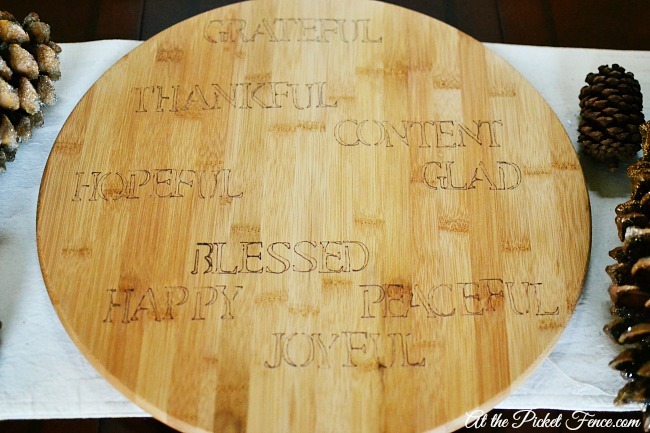 love the idea of spinning that around the table and having guests talk about what they are thankful for etc. I think the beauty of getting older is that we recognize the gifts we need are the gifts that we already have and are thankful for. Have a wonderful fall season! I love the project and the sentiment. The bitter makes the sweet better for sure. You always encourage and inspire! Oh how sweet and special Vanessa! What a beautiful sentiment. Wishing you and your family a blessed and Happy Thanksgiving season. You are so right. Forgetfulness and remembrance kinda flip flop as we age. I like to think we forget the stuff that truly does NOT matter, so we can move forward with the things that really count. 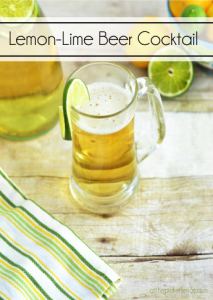 LOVE the post and your project! Any chance to use a Sharpie, I’m in! I love this, Vanessa! 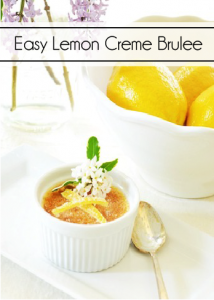 It is so simple and such a wonderful reminder… perfect for this season. 🙂 Thanks for sharing with us! 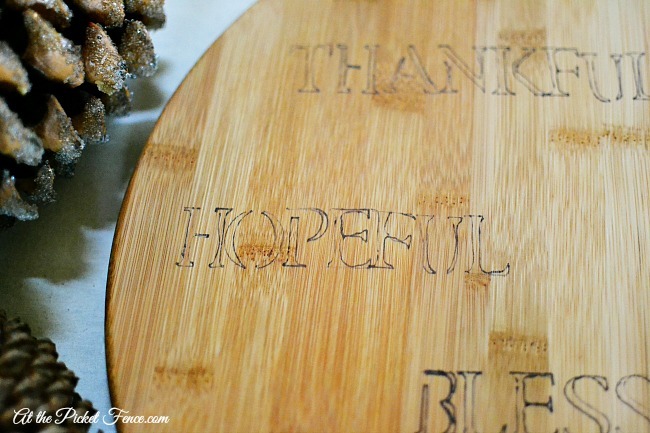 Wonderful project and even more wonderful sentiments! Thank you for helping us to remember what really matters, what we have & have to be grateful for now & throughout the year. Lovely post Vanessa! Oh Vanessa I love this! There are so many times when we all need a gentle reminder to count our blessings. This is perfect. Thank you for always being such a sweet friend to me…you are a gracious and beautiful person. Hoping your Thanksgiving is peaceful! I haven’t visited in a while and love that you reminded me of how blessed and grateful I am! 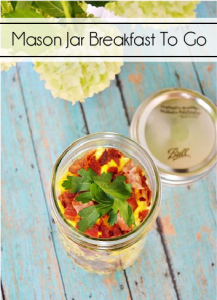 I might just steal this idea for Thanksgiving! I hope you approve!! 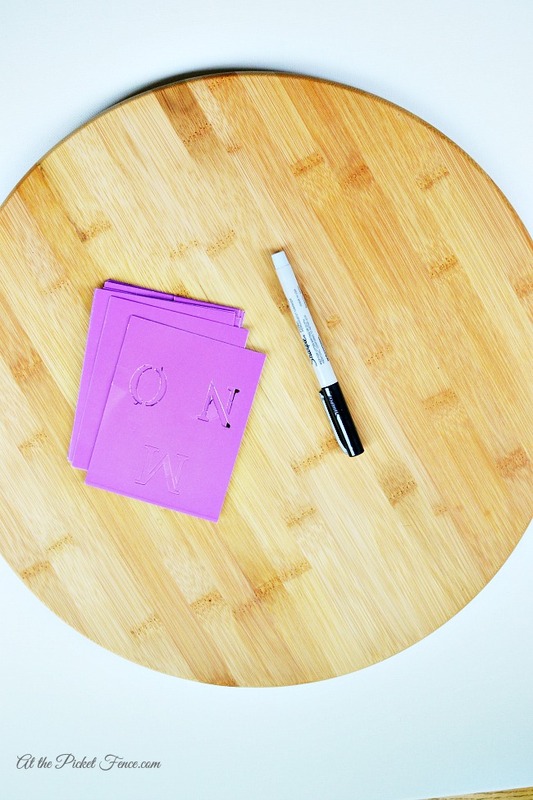 What a cute project- and love your post Vanessa!